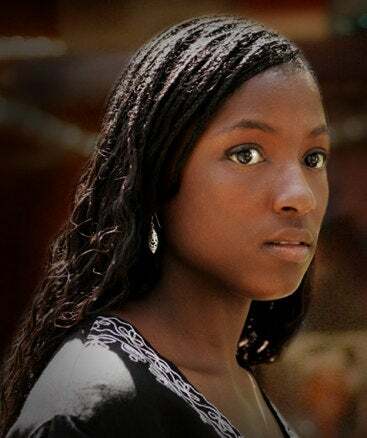 I was staunchly against the Tara Thornton character and her sassy attitude at the beginning of Alan Ball's HBO vampire series True Blood, but Rutina Wesley has slowly won me over with her quick delivery and ability to lighten up Tara's downward spiral. But I guess showing up drunk to a party in your high school prom dress could melt just about any cruel heart. Truly Tara is a character that started out a little raw, but has begun growing on us all with each psychic that she beats the living hell out of. We got the chance to ask Rutina Wesley a few questions and find out whether or not she'd really date a vampire.First off congratulations on the great season and getting picked up when are you going to start shooting again? We start that kinda in January...some in Louisiana and some in LA. So tell me why do you like Tara? She's such a troubled character? It's just her character. It's nice to see an African American character that has so much depth, and is so smart, self educated, she didn't go to college or anything. She's not the Huxtables. She just has a good imagination, 'cause she had to learn it all herself. And just the fact that she uses language as her defense but underneath that is the little flower that you get to see on all of her, that's unveiled all along, and you kinda see her unveil all of that weight that she carries around with her. I saw the leaked pilot with a different actress as Tara, I'm really glad they went with you, how did that happen? Were you called in after the shot it? I just got the audition and I go in and I read for Alan, got called back, and they asked me to test for it, and next thing you know I got the call, it's great. I was excited, I felt I really got Tara, I really understood her in a way I haven't understood a lot of the other characters I've played. I just thought it was a good fit. I wasn't really nervous when I went in, I just knew her. I see you don't have a Southern accent? Was acting with such a thick accent difficult? Well a little twang, a little It wasn't hard I get her, I just get her. Okay, Tara is a deeply troubled character with a lot of demons, how do you deal with that? You just go to the deep dark places in your life or you just kinda put yourself in her shoes. I think if I had a raging alcoholic mother my entire life I would have some anger issues growing up, not even anger issues, defense issues. A lot of people have been arguing that True Blood's vampires are a metaphor for the way homosexuals and minorities are being treated in the world, even though Adam Ball denied it. Do you think that there is a link in the script? I think there is a minority sort of stereotype there, but I think that's still what's going in the world. We have immigrants who want to come over and we're like, "no, get away." It goes back to slavery days, it's like there's so many things, and also gay rights, and just plain human rights, just being able to move from somewhere to somewhere else without anyone giving you crap and that's what I love about True Blood. There's so many underlying things, not just vampires coming in. If you really close your eyes and think about it, you get a lot from it. Things are getting a little hot and heavy with Tara and there have been a few moments, well where the covers almost came off, it's pretty steamy. Are we going to see more steamy moments from Tara? We'll see what happens. You can read the books, everything, it's one season per book. I'm not gonna tell you, but it's gonna be good. What can we look forward to with Tara in the future? You're gonna see more of those layers like peeling away, you're gonna see more of her, and the reason why she is the way she is. Now is Tara ever going to date a vampire? I don't know, cuz right now she's, no, absolutely not. Especially not that one cuz he owned slaves. So absolutely not. What's been the best part of working on True Blood so far? Just the people and working with Alan Ball and HBO and the company of actors who are really amazing and welcoming, so I mean we're all having a lot of fun.